Happy Monday/Tuesday! This post was supposed to go out yesterday but due to unforeseen circumstances... it did not. I am a planner and some days just don't go as planned, as hard as I try. In fact, I missed my book club last night due to a photo shoot running later than I thought... but had so much fun! More on that in an upcoming post! My closet is an average size, not over-sized, so I switch my summer and winter clothes 2x a year and keep a running tally (list) of what I have and what I need and what I would like to add including shoes, bags, and accessories. That means that twice a year, I go through and donate items I no longer wear for the upcoming season to Dress for Success or another charity. This keeps my wardrobe fresh and updated. I have some guidelines that I use when shopping that you may find valuable, too. These apply to most everything with the exception of special occasions. 1. Will I wear an item multiple seasons? In the south, we can wear things longer since our seasons tend to drag into each other. 2. Is the cut flattering for my figure and will it be in style for at least a couple of years? 3. Is the color flattering on me? Does it accentuate my skin and hair color? And will the color take me through a couple of seasons? 4. Do I see myself wearing this item more than 4 times? If yes, that means, I will wear it a lot more but if not... it's a waste of money as I try not invest in items that just hang in my closet. 5. If I don't buy it will I be sorry? This is a big one. Typically, if you like something a lot...buy it then because if you go back... I guarantee it will be gone. 6. Is it on my list or a variation of what I need to compliment my current wardrobe or for an upcoming event? 7. Is it good quality? Your wardrobe is an investment...invest in good quality. It will show, your feet won't hurt and you will always be happy with your purchases. 8. Is it a closet staple that you can wear numerous ways? My Eileen Fisher Moto Jacket, my favorite Jean Jacket, my favorite black pumps, tailored slacks, etc. are all worn time and time again and dressed up or down. 9. Will I wear it with confidence? If I doubt that I will, it's not a good purchase. 10. I am buying it just because it's on sale and a good deal? I'm guilty of this too! I always feel like it easier to justify a purchase but if it does not fit my guidelines above, I don't buy it! I bought this simple J. Jill blue knit dress and have worn it as shown, with tights and flats, with boots and numerous ways already. Same with the shoes, purse, and necklace. In fact, I have built a couple of outfits around the necklace because I like it so much and knew it would fit my "wardrobe list!" Do you have shopping guidelines you "try" to live by? If so, I would love to hear them. What's on your fashion shopping list? Please share in the comments below! Ever since I was first married, many moons ago, when I had to go out to get something, I always told Mr. Silver, I will be out "running errands." (Mr. Silver does not share my love of shopping.) This could really mean a lot of things; but to me, it meant getting stuff done, on weeknights or weekends when I was not flying around the country for work. However, it also meant that I did not have to hurry and I had time to browse and look around. Sometimes, errands could be quick, or sometimes they took awhile. Have you ever noticed that when your husband goes out to get something he is quick about it? To be perfectly frank, I am not quick... as I like to "look around." Therefore, in our house, (including my kids), they still like to ask/kid me if I've been out "running errands!" HA! Why yes I have! And I don't mind at all because it provides, me some "me" time!! Do you "run errands," too?? I found this fun, long hoodie (super comfy) at J.Jill recently. It is perfect for the spring. I am also wearing black leggings and a black J.Jill long sleeve tee (a great wardrobe basic.) Wearing my favorite Sam Edelman, black Carin espadrilles, (which they have brought back for another season), a silver bangle and earrings (FTC) and my new Silver backpack. 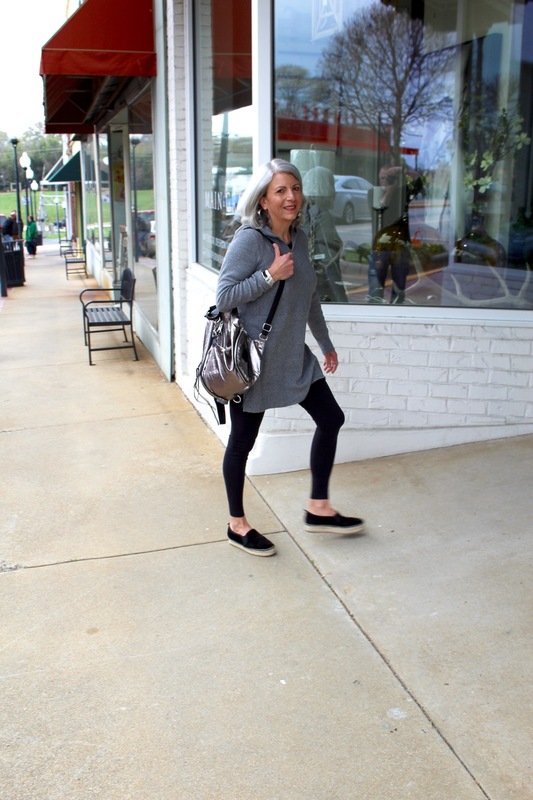 This outfit is easy and comfy for some important errand running! :) You can find all details below. Have a great rest of the week and as always, thank you for stopping by the blog. 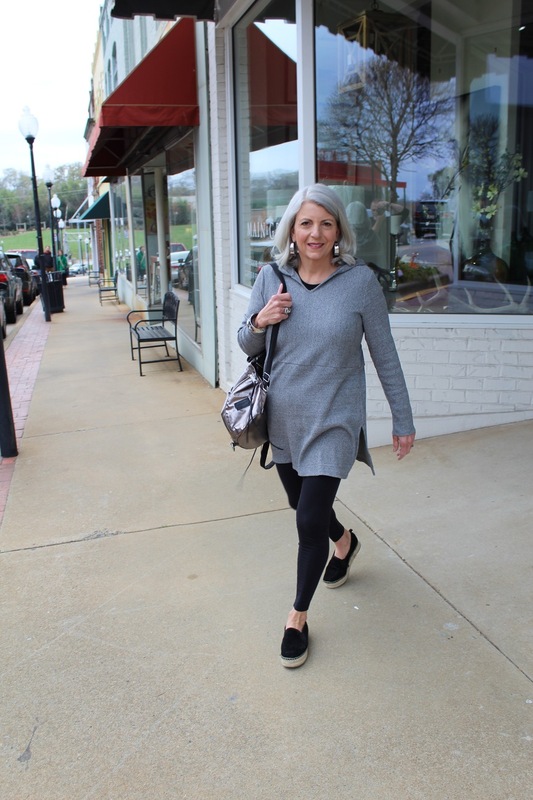 My goal is to share authentic ageless style; fashion, beauty and relevant lifestyle information as we share this fun journey together! I appreciate you!